Prune trees are pruned to thin fruitwood, improve fruit size, reduce alternate bearing and control tree size and shape. Selective hand pruning with ladders and loppers, one of the most expensive cultural practices, has long been thought best because the selectivity cannot be matched by mechanical pruning. Previous studies of mechanical pruning have shown pruning severely enough to achieve equal fruit size and value per ton as hand pruned treatments resulted in reduced yield. Increasing labor costs and new developments in mechanical pruning equipment have increased interest in pruning strategies that incorporate cost effective mechanical pruning strategies. Between 2006 and 2009 nine pruning strategies were compared in a mature highly productive French Prune block with 183 trees per acre planted north-south at a spacing of 14 x 17 feet. Prior to the beginning of pruning treatments the trees were 17-18 ft. tall. The hand pruned treatment with ladders and loppers (Std) represented a typical dormant hand pruning. The other treatments in addition to the mechanical pruning treatments, summarized in Table 1, were hand pruning annually without ladders using a combination of pneumatic pole pruners, pole chainsaws, pole loppers and long handled loppers. This pruning was less detailed removing fewer large branches to allow light penetration into the canopy. The mechanical pruning treatments included flat topped (T) at approximately 15 feet, “roof topped” (RT) at 12 feet on the outside of the tree and 15 feet in the row center, “V” by making a slanted cut on the east and west side of the tree row to form a V in the center of the tree 12-14 feet at the bottom center and 17 feet at the top on the outside and a “Mohawk”(MH) where slots were cut in the shoulder of the canopy on both sides of the row, leaving the center uncut. Mechanical pruning timings included dormant (D), summer (S) in June and post-harvest (PH) in September. After the first year, due to an excessively vigorous response, the dormant mechanical pruning timing was shifted to post-harvest to reduce vigor. During the trial, there were two years of moderate crops (2006 and 2008) and two years of heavy crops (2007 and 2009). In the first year of the study, all mechanical treatments had a higher yield and value per acre than the standard pruning treatment (Table 1). This was due to a moderate fruit set overall which resulted in good fruit sizes with no differences in value per ton between treatments. The standard pruning treatment reduced the total yield and, therefore, the value per acre. In 2007 and 2009, fruit set was heavy and all of the treatments required intervention to size the fruit and prevent tree damage in addition to the mechanical pruning treatments. These steps included mechanical thinning, mechanical skirt pruning, cluster thinning with poles, mechanically cutting a narrow alley (1 to 2 feet) in the row middle and propping as needed. The estimated cost with overhead for the standard hand pruning has been $3.25/tree or $594/ac. The dormant ground pruning with overhead is estimated to cost about $200/acre. The mechanical pruning is estimated to cost about $40/acre, so, the mechanical plus dormant pole saw pruning cost would total $240/acre. Through the first three years of the trial, combined value per acre for all mechanically pruned treatments was greater than the standard pruned treatment (Table 1). 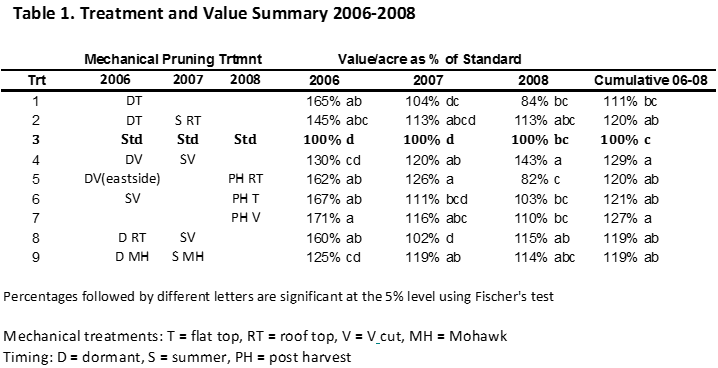 While data for 2009 is not completely summarized dry yield per acre was the lowest for the standard pruned treatment and there were no differences in dry count per pound for any of the treatments. These results indicate an opportunity to reduce pruning costs while increasing net return per acre.